XD That was funny! The owners scare the goats and they all go crash! One of the Smithsonian museums have talking trash cans. I forget what it said, but I was very startled! Now I want to go on a trash can tour! I want one! 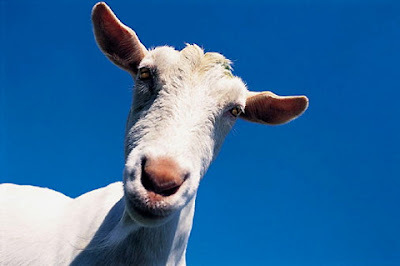 Have you ever milked a goat? It is surely an activity not to be missed. Or ever forgotten. I saw those before...in the tv. But those are pretty funny. LOLZZZZZZ I laughed to death! Garbage-eating goat? The world is so strange. Ananka/Kirsten: Sorry if I'm not commenting often or updating my blog. My laptop busted. I just snuck into the school computer lab and now using it, unbeknownst to teachers. I LOVE the garbage eating goat!!! my dad showed me that exact same video like, two years ago!! wierd. omg! ^.^ thats SO hilarious! HAHAHAHAHAHAH!!!!!! invisible turtle: really? on the simpsons theres a talking trash can. i wanna see one too! my freind has two goats. and five? seven horses? i dunno. she has horses and goats and dogs and brithers and alot of chips. thats all i know. Oh yeah, you reminded me of something I saw Invisible Turtle! I remember somewhere in Disney, I saw these trashcans that can talk and terrorize tourists to to not litter! goats are cool. so are chickens. ROFL I spent the whole time laughing! Oh, that goat is just the qutest! ^^ And I loooooooove Japan to, it's just the most amazing country! in 'defining dulcie' ( i don't remember the author), Dulcie visits a fainting goat farm. that's so hilarious, they fall every second, and get up again!